This newsletter enables you to remain informed about new releases in the Gratianus Series. 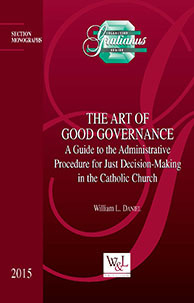 When preparing to make important administrative decisions in the governance of those subject to their pastoral care, some individual ecclesiastical authorities may intuitively follow an administrative procedure of sorts, such as by hearing in advance those who will be affected by the decision. Other authorities, though, may not take any major steps prior to making a decision in a particular case, perhaps even in good faith. This inconsistency leaves the Church exposed to giving the impression of injustice in her administrative activity, and this hinders her ability to shine forth in the world as the Mirror of Justice. In order to overcome this problem, it is incumbent upon ecclesiastical authorities and those advising them to come to a deeper appreciation of the procedural implications of the art of good governance. This volume aims to foster a more profound understanding of administrative procedural norms in order to aid those whose duty it is to govern well and to protect the right of Christ’s faithful to a just administrative procedure. The norms’ fullest sense is captured in light of the doctrine and jurisprudence that explain and illustrate them, and so these scientific elements are explored in depth. This study finally explores avenues for their possible future reform and even articulates a concrete proposal in the form of draft norms that could be adopted by canonical legislators. 45 visitors have consulted this page. Copyright © 2019 Wilson & Lafleur All Rights Reserved.